In The Negative, battles are primarily fought with the help of up to 4 monsters of your choice. You can customize these monsters to suit your needs. There are currently 120 monsters planned for you to collect, and each one is unique in terms of aesthetics, stats, skills, and the types of items they can equip. This post will provide you with an in-depth look at how monsters work in The Negative! Each monster belongs to one of 6 classes: Chaos, Death, Life, Nature, Sorcery, or Void. A monster’s class is primarily defined only for roleplaying flavor, but some skills and items also interact with specific classes as well. Monster fusion (the process of combining two monsters into a new one, which will be discussed in a future post) makes use of the class system as well. You can acquire monsters in several different ways. The most straightforward way is to weaken an enemy monster in battle, then capture its essence using an item called an “Amulet”. You’ll want to make sure you stock up on Amulets before venturing outside of a town – you never know when you’ll encounter a monster you want to add to your party. However, some monsters can’t be captured this way, and can only be obtained by completing certain quests or by fusing other monsters together to create new ones. The rarest monsters in the game cannot be captured, so you’ll need to explore every corner of the world in search of hints to point you toward the most coveted ones. Monsters have several different stats that affect their fighting abilities. These stats can be improved by leveling up your monsters, equipping them with more powerful gear, or using special elixirs in battle to temporarily bolster their strength. Health: when a monster takes damage, it loses Health. If it falls to zero, the monster dies. Health does not regenerate after battle, so you’ll want to keep a supply of potions on hand to ensure your survival. Mana: monsters can use skills in battle, and these cost a certain amount of Mana. Much like Health, Mana does not regenerate after battle. Power: determines the potency of the monster’s attacks and skills. The higher a monster’s power, the more damage and healing it’ll do, and the more effective its debuffs and stat reductions will be. Defense: determines the amount of damage a monster takes from incoming attacks and skills. Higher defense means your monster will take less damage from all sources. Speed: determines the rate at which monsters can take a turn in battle to attack, use a skill or item, defend, or move to a new area on the battle grid. Extremely fast monsters can take multiple turns before others get the opportunity to take even one! Luck: determines the chance and potency that monsters have to deal critical damage or dodge attacks and skills. Some skills also utilize Luck to affect their potency. Resistances: monsters take more or less damage from each of the 6 classes depending on their resistances. Unlike all the other stats mentioned above, Resistances are the only stats that do not increase as a monster levels up. Resistances are determined by the type of monster, and can only be increased by equipping certain items or using elixirs in battle. Each monster has a certain personality which affects their stat growth each time they level up. For example, an Analytical monster gains more Mana and Speed than non-Analytical monsters when they level up, but also gains less Power and Defense. You may need to capture multiple monsters of the same type before finding one that has the personality you want. Monsters have two types of skills: active and passive. Active skills must be used manually in combat and cost a certain amount of Mana. These skills can be used to damage enemies, heal allies, afflict nasty debuffs or grant helpful buffs to monsters, and much more. Passive skills are always activated, and tend to be more straightforward than active skills – they might increase the monster’s stats by a certain amount, grant them immunity to a certain debuff, or even do something more interesting like summon a skeleton ally at the start of battle. Each monster will learn different skills as they level up. Each monster can have up to 4 active and 4 passive skills, and if a monster tries to learn any more than that amount, you must delete a skill first. However, monsters can surpass this limit by equipping certain items. For example, there’s a shield that grants the equipped monster the “Shield Toss” skill. This skill can’t be learned by any monster in the game and is exclusive to this item! Monsters can also pass their skills on to their offspring after fusing two monsters together, but as I’ve said before, that won’t be discussed in this post. See you next week! Today marks the start of a weekly (or sometimes bi-weekly) series of development updates for The Negative! Each post will give you an in-depth look at a certain feature associated with the game. In today’s post, we’ll discuss the general flow of the game (that is, a brief overview of how the game is played), and also reveal a unique game mechanic called “Positivity”. Please note that any visuals shared in these posts are simply meant to serve as proofs of concept. A lot of the game’s art isn’t finalized, and we’re still using a lot of placeholders. In particular, the tileset we’re using to show off today’s features is a placeholder and probably won’t make it into the final game. Players will start their journey in an environment modeled after the concept of “Depression”. This environment takes place in a giant set of ruins that have been long ago abandoned, and consumed by snow and ice. Many of the objects and quests in this environment are related to snowfall (yes, The Negative has dynamic weather effects), and some objects can be used to manipulate the severity of the snow. Each environment has a “gimmick” similar to this one. The goal is for each environment to cause players to play the game in different ways. The Negative features dynamic weather effects, such as snow, rain, wind, and even ashfall. Players must seek out towns (which are also procedurally generated) to complete a series of quests related to Depression, ultimately culminating to a major boss fight. In total, the player will travel through all seven of the branches of negativity as discussed in my last post: depression, rage, guilt, jealousy, pessimism, anxiety, and grief. The game’s story concludes with one final boss fight. Each environment also contains several “sub-environments” that players can enter. You might stumble upon a cave or an abandoned tower that you can explore. At the end of this sub-environment will be a powerful enemy that you can kill, rewarding you with a large treasure chest. These sub-environments are generally optional, although some main story quests and side-quests might require you to defeat a boss contained within. Be warned: these areas tend to be much more challenging than anything you’ll find outside! In order to give players the feeling of an open world, you might encounter dynamic quests during your travels. Maybe an NPC is being harassed by a pack of enemies, or a totem is being channeled by a powerful foe to empower enemies in the area. These quests are entirely optional but are intended to make the world feel more alive. One of the many different types of treasure chests you’ll encounter during your travels. This is a rare one, and probably contains something powerful! After you visit a world for the first time, you can visit it again any time you want – it’s permanent. This means that the more you play the game, the larger your world will become. At any point in time, you can go back and visit the same NPCs and explore the same dungeons that you’ve encountered before. There are also a few items you can use to manipulate these worlds after you’ve conquered them. After completing the main story quests, you can progress to the post-game content, which will be discussed in greater detail in a later blog post. Later on, I’ll dedicate at least one full blog post to discussing battles, but I’ll also give you a brief overview of them right now. During your travels, you’ll come across a wide array of enemies. Some will chase you, while others will flee when they see you, depending on the monsters’ behavior. Others will simply patrol an area, stay in place, or ignore you altogether. Some are fast, some are slow. Enemies can be caught in traps to hinder their movement. They are even affected by the weather – they’ll move more slowly when it’s snowing, and won’t be able to see you as easily when it’s foggy. When you make contact with an enemy, a battle will begin. Enemies take the form of “The Negative” in the overworld. When you touch them, a battle begins, and the enemy monsters contained within The Negative are revealed. 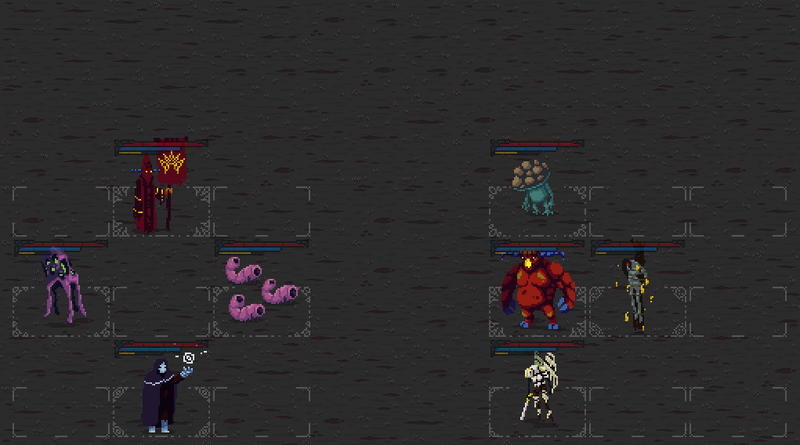 Battles are turn-based, and you can use up to four of the monsters you capture to fight for you. Monsters can attack, defend, use a skill, use an item, or move to a different area on the battlefield. After you defeat the enemies, your monsters will gain some experience points, and your character will gain the game’s currency: Zeal. Zeal is used for just about everything. It is used to buy items, craft items, enhance your equipment, fuse your monsters into new ones, and much more. But Zeal’s most important use is to level up your character. Unlike your monsters, who gain experience points after each battle, your character can only level up by spending Zeal. In addition, your monsters’ levels cannot exceed that of your character. Of course, your monsters can continue to earn experience points even while your character’s level is inhibiting their growth, so the experience points your monsters gain will never go to waste. The amount of Zeal your character has also affects its level of “Positivity”. In The Negative, your character emits a small amount of light all around it, and you can’t see very well outside of that light radius. Enemies can ambush you very easily, and it’s more difficult to see useful objects such as treasure chests and ore nodes when your light radius is short. You can expand this light radius by holding more Zeal. 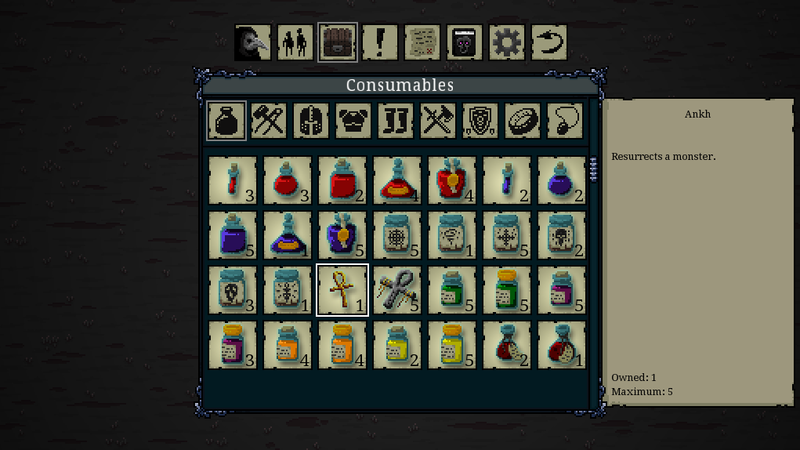 This means that players will sometimes need to make difficult decisions about which items to buy, when to level up, and when to explore the world. Should you buy that health potion to ensure your survival, or hold on to your Zeal so you can see farther into the distance? Some items can only be seen when your character is 100% “Positive”, which causes the light around your character to become golden. Your character’s light radius grows as you gain more Zeal, allowing you to see farther into the distance, and sometimes even reveal hidden secrets. If your party is wiped out, you’ll drop all your Zeal on the ground. You’ll have one opportunity to find and retrieve it, but if you die again before retrieving your lost Zeal, it’s gone forever. That’s what I meant in my last post when I mentioned that The Negative feels a lot like taking one step forward and two steps back. Your character’s Positivity is cyclical, and will come and go countless times as you progress through the game. You’ll be forced to make difficult decisions and will sometimes suffer unavoidable hardships as you’re forced to sacrifice one boon for another. When you use Zeal to buy items or level up your character, your light radius also decreases. In that way, positivity and negativity are cyclical. I hope you enjoyed our first devlog for The Negative! See you soon. Announcing Our New Game, “The Negative”! 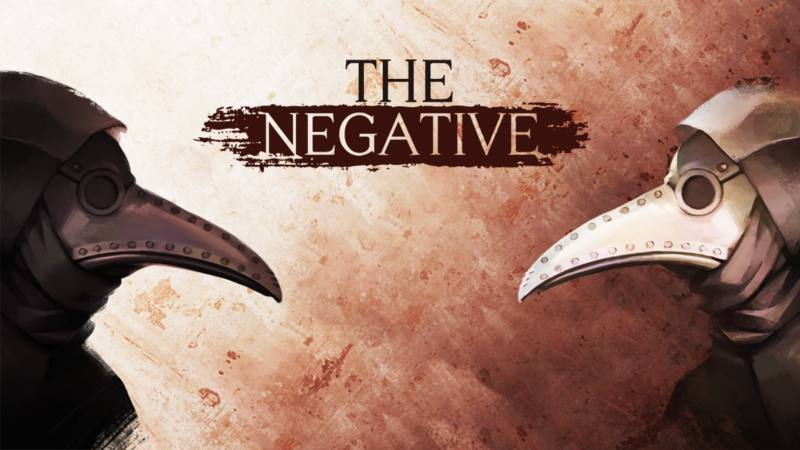 I am pleased to announce Thylacine Studios’ next game: The Negative! 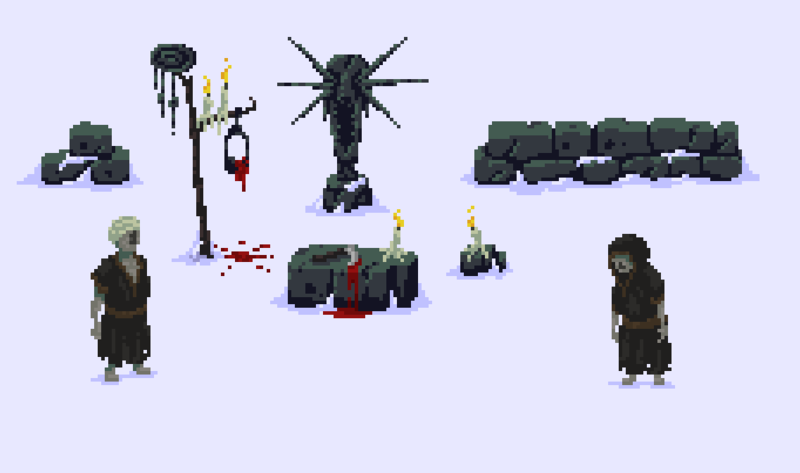 A mockup image containing a few objects and NPCs you might find during your travels. The Negative is an evocative RPG with a dark, gritty, and gothic undertone. Players take the role of a nameless plague doctor as they wander across an infinite, procedurally generated open world in an attempt to conquer an evil force known as The Negative. 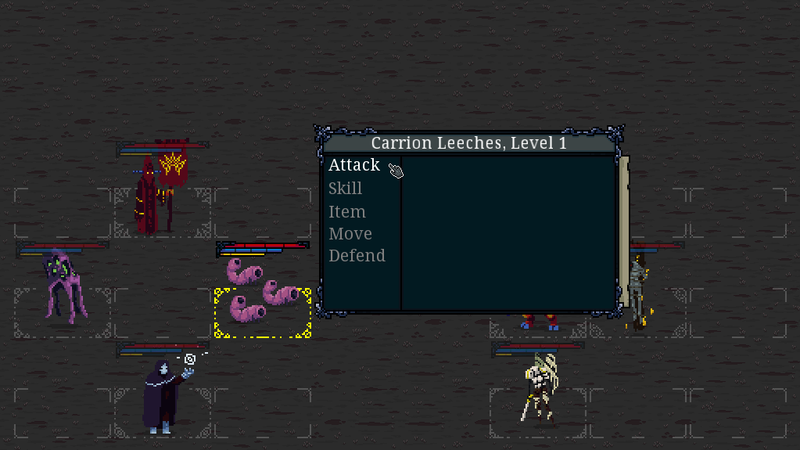 Along the way, players must capture and employ the skills of enemy monsters to fight for them. Battles are turn-based. You can take up to 4 monsters with you to fight your enemies. Thematically, The Negative is all about conveying emotion; not only through its storytelling methods, but also in the environments and enemies themselves. I’ve broken down the concept of negativity into 7 main categories: depression, rage, jealousy, pessimism, guilt, anxiety, and grief. Almost every aspect of the game relates to one of these emotions in some way – there are 7 different environments to explore (and re-explore), each of which is modeled after one of these seven emotions. This means that, with a few exceptions, we won’t be using any generic environment types you might find in other games, such as a “fire world” or “forest area”. You can move your monsters around the battlefield to gain various advantages and exploit your enemies’ weaknesses. The Negative definitely isn’t a happy game, and it’s unapologetic in the way it casts players into a lonely, desolate world where all hope feels lost. In most cases, players will often find their efforts feeling like they’re taking an allegorical “one step forward, two steps back”. In that way, it feels a lot like real life. Happiness is cyclical, and The Negative honors that fact in every way it can. 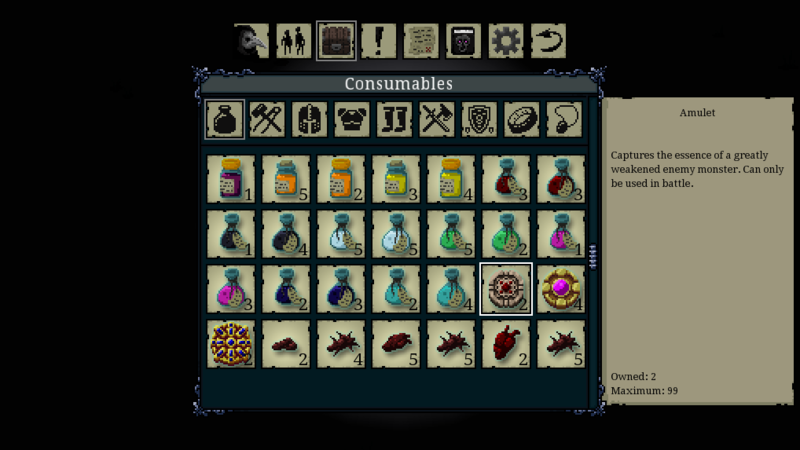 This is the inventory screen. You can heal your monsters, resurrect them, and much more here. I have plenty more information to share with you, but it’ll have to wait. Check back next week to learn more about The Negative! I’ll leave you with a small FAQ. Q. When will The Negative be released? A. It’s too soon to tell. I have probably 70% of the game coded already, but there’s a lot more work to be done, especially in the art/music department. My best guess is an early 2018 beta release on Steam Early Access. While we’re waiting, I’ll possibly release at least one smaller game to sate your appetite. Q. What platforms will The Negative be released on? A. Definitely Windows, Mac, Linux, iOS, Android, and Playstation 4. I’d also like to release this game on Xbox One and Nintendo Switch, but it’s too soon to tell if we can make this happen. If any other major platforms enter the market between now and the end of The Negative’s development cycle, I’ll gladly consider those as well. Q. What about Playstation Vita? A. I’m developing The Negative using GameMaker Studio 2, which no longer supports Playstation Vita, so there’s no way this is going to happen. Sorry! A. Right now, I’m thinking $19.99 USD is a fair price, but that’s not final. The mobile (Android/iOS) version will likely use a different payment model. Q. What are the controls like? A. The game supports keyboards, gamepads, and mice. You can play the entire game with just your mouse, which actually works really well! Q. Will there be any post-release content? Expansions? Sequels? A. Yes, probably. If it happens, this content will be delivered and priced in a way that no other game has done so before. I’m excited to experiment with my own payment model, but it’s too soon to announce any specifics on that! Q. Does The Negative have multiplayer? A. No, there are no plans to add multiplayer content for now. There might be some online-only events, but nothing like trading or PvP battling. Q. How does The Negative compare to Siralim? A. It’s completely different in almost every way. You still capture monsters and fight with them, but everything else is completely different.